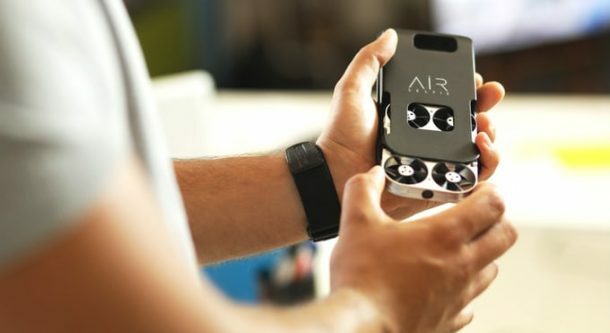 Drones of the modern day are getting incredibly cheaper and smaller, and this “selfie” drone called the AirSelfie is the latest testimony of this awesome trend. 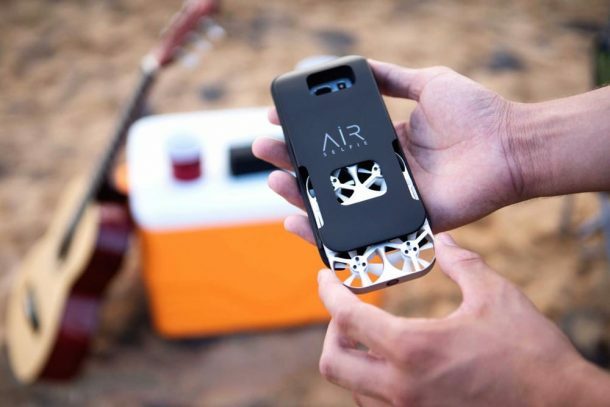 AirSelfie is a flying camera which can help you catch the memorable moments from amazing angles and perspectives without carrying a cumbersome selfie stick. This flying camera can easily slide away into the user’s pocket when not in use, and only weighs around 50 grammes. The hardware includes a 5 Mega Pixel camera that can hover around autonomously for over 3 minutes while you find the perfect angle to catch a selfie or make an HD-quality video stored in the 4 GB onboard memory. 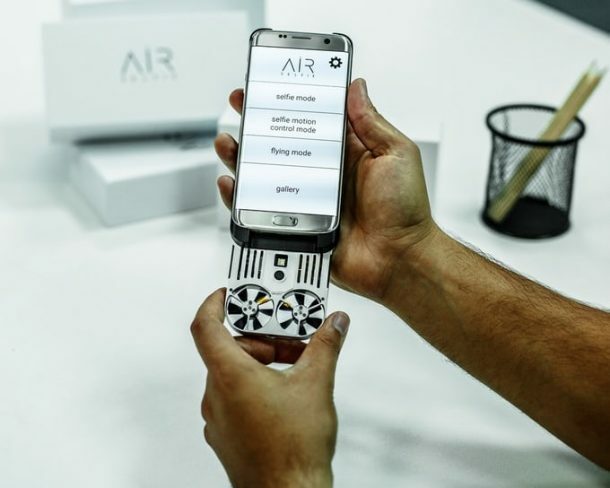 AirSelfie’s aluminium frame has the dimensions of 3.72 x 2.65 x 0.42 in (9.5 x 6.7 x 1 cm), which means it is comparable to an average smartphone and can be stored in a purpose-built smartphone case. This case also entails a battery, which recharges the drone within 30 minutes for the next session of selfies. The drone can be controlled using the iPhone 6, 6s, 7, 7 Plus, Huawei P9, Google Pixel and Samsung Galaxy S7 Edge using a companion app. 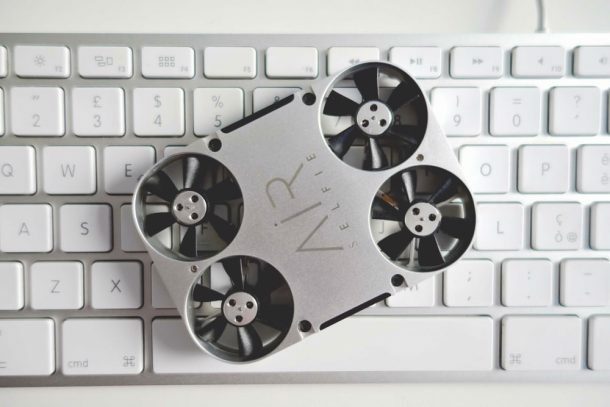 It supports a separate power bank which can charge the drone up to 20 times, while also allowing it to be charged directly from a Micro-USB port. The drone comes with three different flight modes, out of which the “Selfie mode” seems to be the simplest and most useful, where a novice user will only have to manoeuvre the drone closer or farther away. Another mode involves using a single virtual joystick for control, while the most complicated one simulates a classic drone controller using a horizontally held phone. The captured photographs can also be downloaded and shared using a smartphone app over the Wi-Fi connection. The mini-drone truly packs a punch and has the capability to fly up to 66 ft (20 m) in altitude for over three minutes on a single recharge. 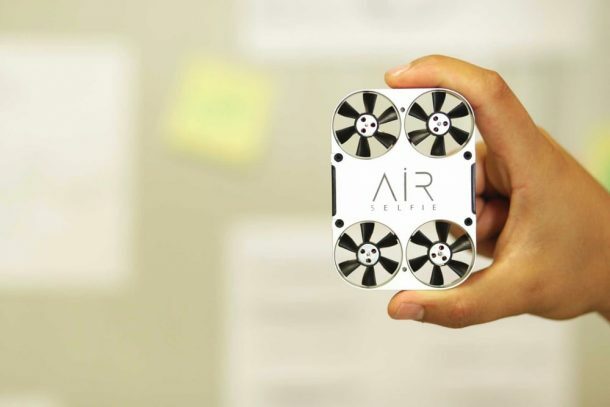 AirSelfie drone has started a Kickstarter campaign for the project, with its makers looking to reach the pledged goal of €45,000 to start production. Early pledges of €179 (US$189) are available, which will send you a drone, a charging phone cover and Micro USB cable by March 2017. What are your thoughts on this amazing selfie technology? Comment below!